WASHINGTON, DC, July 24, 2014 (ENS) – U.S. 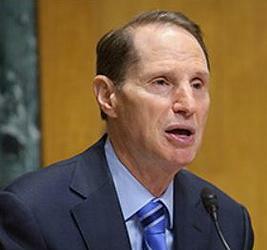 Senator Ron Wyden of Oregon is worried. “We’ve got 13 fires burning across Oregon, over 600,00 acres ablaze right now,” he told reporters on a conference call Wednesday. Climate change is producing hotter, drier conditions across the American West, which contribute to more large wildfires and longer wildfire seasons, the report states. Wildfire risk to people and their homes is rising, worsened by the increasing number of homes and businesses being built in and near wildfire-prone areas. Past fire suppression and forest management practices have led to a build-up of flammable fuel wood, which increases wildfire risks. As the number and size of wildfires increases, firefighting costs are soaring. The expense of fighting wildfires and protecting life and property from harm is nearly four times greater than it was 30 years ago and has exceeded $1 billion every year since 2000, as accounted in 2012 dollars, according to the report. Other costs, including the impact of wildfires on public health, property, ecosystems, and livelihoods, often far exceed firefighting costs, the report finds. 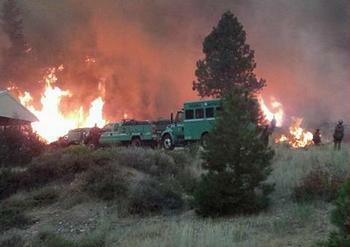 Today’s biggest worry is a complex of five fires in east-central Oregon. 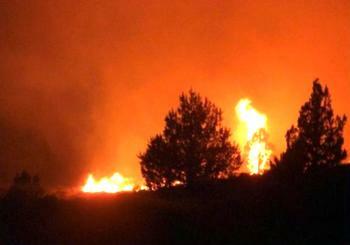 The 395,747 acre Buzzard Complex was started by lightning 10 days ago in ranch country. With the help of some rain, the fire complex is now 95 percent contained, with 359 firefighters still on the job. On Tuesday, 960 firefighters were on the scene along with 17 fire engines, four bulldozers and support fixed wing aircraft and helicopters. The whole operation has cost millions. Not only is Senator Wyden worried about the damage the wildfires are doing, as chairman of the Senate Finance Committee, he’s worried about how to pay for fighting them. Joined by fellow Oregon Senator Jeff Merkley, Wyden is working with Congress to pass a proposal from the White House for additional fire funding to treat the catastrophic wildfires now raging in states across the West. President Obama has asked Congress for an additional $615 million dedicated to wildfire suppression costs. The request includes language to allow some fire suppression funding to come from a disaster account, based on legislation Wyden and Merkley introduced last year, along with 13 bipartisan cosponsors. This bill would end the practice of “fire borrowing,” which occurs when the Forest Service and Interior Department are forced to take money from other important programs to make up for a lack of funding in fire suppression accounts. Currently agencies base wildland fire suppression budgets on the average costs of the past 10 years, which has underestimated the actual costs 8 of the past 10 years. Figures from the U.S. Department of Agriculture and the Department of the Interior show that this year’s fire season is already projected to exceed the current budget by $615 million. Federal agencies are expected to spend $1.61 billion fighting fires this year, but have only $995 million available for firefighting. “To fight fires, we have to divert funds from other programs for the management of forests, rangelands and fuels treatment programs,” said Douglas. “In the past we have funded fire suppression by hoping low wildfire years would average out high years, but firefighting costs have increased every year. So we have less funding available for preparedness, for wildlife management,” Douglas said. Meanwhile in Congress, Wyden and Merkley, both Democrats, are pressing for a vote on their bill, the Wildfire Disaster Funding Act (S. 1875), which has bi-partisan support from Senator Mike Crapo of Idaho and other Republicans. On July 15, with large wildfires charring lands across central Idaho, Senator Crapo urged passage of S. 1875 before the Senate Energy and Natural Resources Committee. As Congress tries to get some work done before the August recess, wildfires continue to spread across the West, fueled by climate change. The Union of Concerned Scientists’ report states that temperatures in the American West have gone up quickly. Since 1970, they have increased by about twice the global average. In addition, snow melts earlier in the spring. Hotter, drier conditions last longer than they used to. The result is a longer wildfire season and conditions that are primed for wildfires to ignite and spread. The western wildfire season has grown from five months on average in the 1970s to seven months today. The annual number of large wildfires has increased by more than 75 percent, the report finds. “This is a recent and dangerous alteration of the natural, long-standing, and necessary role of wildfires as part of the forest landscape,” says the report, which projects that wildfires will worsen over time as temperatures continue to rise. Since 1970, regional temperatures have increased by 1.9 degrees Fahrenheit. By mid-century, temperatures are expected to increase by an additional 2.5 to 6.5 degrees Fahrenheit. Development patterns are making the situation worse, the report warns. Over the past 50 years, there has been an increase in new home development near wildland areas, where wildfire risk is high. In 2000, the U.S. wildland-urban interface (WUI) contained more than 12.5 million housing units, a 52 percent expansion from 1970. There are three types of solutions, the scientists advise in their report. – To better prepare for wildfires, protect people, and help maintain healthy forests, we should incorporate the latest science to improve wildfire mapping and prediction; invest in public awareness, fire-proofing, and fire safety measures; and ensure that forest and fire management practices reflect changes in climate. – To reduce exposure to wildfire risk, development patterns and zoning policies should limit further building of homes in high-risk areas, insurance premiums should reflect actual wildfire risk, and homeowners and local communities should incentivize fire-proofing measures and assume more responsibility for mitigating wildfire risk. – To effectively address the growing long-term wildfire risks caused by global warming, we must take steps today to reduce the heat-trapping emissions that are driving climate change.